The internal combustion engine has undergone vast transformation, and ongoing improvements will ensure this continues into the future. Alongside this, industry is investing heavily in alternative powertrains, including ultra low and zero-tailpipe emission hybrid and pure electric vehicles, and even those powered by hydrogen. There are currently three fuel categories – alternative fuels, diesel or petrol. Under Euro 6, diesel cars are the cleanest in history. Nitrogen oxides (NOx) and particulate matter (PM) emissions have been cut significantly in recent years, thanks to sophisticated exhaust after-treatments and advanced engine design. Here are some of the key technologies that have made it happen. The turbocharger increases an internal combustion engine’s efficiency and power output by forcing extra air into the combustion chamber. In combustion, the higher the pressure at which fuel is injected into the cylinder, the cleaner and more efficiently the fuel is burnt. A common rail is a high-pressure fuel reservoir which supplies the injectors with fuel in a sequence of pulses, fractions of a second apart at pressures even higher than those found on the seabed in the deepest of oceans. Exhaust cam timing ensures the exhaust catalytic converters reach optimum temperature as quickly as possible, improving efficiency and optimising emissions reduction. The intercooler cools the air from the turbocharger so that more air can be forced into the engine, promoting more efficient combustion. The higher the temperature in the cylinder, the more NOx is produced. EGR controls NOx emissions by recirculating a small amount of inert exhaust gas back through the engine to reduce the engine temperature and therefore lower NOx emissions. Continuous advances in vehicle technology have ensured the petrol-driven cars we use today are unrecognisable compared with those we relied on even just 10 years ago. Massive investment has resulted in an evolution of the combustion engine, and vastly reduced tailpipe emissions. The ECU keeps the engine in tune, ensures smoother running so emissions are controlled, and prevents over-revving. The three-way cat operates in a closedloop system, including a lambda or oxygen sensor to regulate the air to fuel ratio. It converts around 90% of NOx and HC emissions to harmless nitrogen and water, and CO to CO2. VVT changes the amount each valve is opened by a small degree to optimise engine efficiency and reduce NOx and CO2 emissions. Injects the fuel accurately to ensure it burns more efficiently. Until recently, alternatively fuelled vehicles (AFVs) have remained a niche choice but now we are seeing a rapid increase in uptake as manufacturers introduce new models, consumers become more aware of their benefits and infrastructure develops. British car buyers now have over 35 plug-in cars to choose from, up from just six in 2011. The UK is currently the fastest-growing market for plug-in cars in Europe, while it is also home to a dedicated battery manufacturing plant and produces the world’s best-selling all-electric car. Pure electric vehicles (EVs) date back as far as the car itself: one of the first land-speed records was set by an electric car in 1899. Powered solely by batteries, they use an electric motor to turn the wheels, and produce zero emissions from the tailpipe. Pure EVs are becoming increasingly viable for an ever-growing number of people. 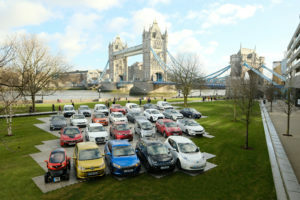 One of the major investment areas by manufacturers is increasing the distance between charges, resulting in a range of up to 100 miles for the majority of EVs – a favourable comparison with the average car journey in the UK, which is less than 10 miles (Source: DFT National Travel Survey 2013). Many AFVs employ both a small internal combustion engine and an electric motor to deliver combined benefits. These can offer additional range over a pure electric vehicle while still delivering significant emission and cost benefits. In a full hybrid, either the engine or the electric motor can power the wheels – and this will change depending on the charge of the battery as well as the amount of power required at a given moment. A plug-in hybrid works in the same way, but the battery can also be recharged via an electric chargepoint – giving greater potential for zero-emission driving. Range extenders feature a small-capacity internal combustion generator to provide ‘on-the-go’ recharge if necessary. Hydrogen fuel cell vehicles are zero-emission electric vehicles, which use hydrogen fuel cells to generate power. Hydrogen – stored in an on-board fuel tank – is combined with oxygen in the fuel cell, and the only outputs are electricity, heat and water. A number of manufacturers are investing heavily in this technology, and in 2015 the first full-production hydrogen fuel cell vehicle went on sale in the UK. Further uptake will require support in developing the refuelling infrastructure. Biofuels deliver the simultaneous advantages of using renewable energy and enabling the reduction of some pollutant emissions, including particulate matter. Significant research and development is taking place into a range of different biofuels, including ethanol, biodiesel and natural gas. Petrol and diesel sold in the UK already contains some biofuel: the former with up to 5% ethanol, and the latter with up to 7% biodiesel. As further advances are made in this area, it is expected that biofuels will become more prevalent in motoring and other road transport.